National Park Week kicks off on April 21. The National Park Service (NPS) isn't fond of burying the lede, so they've made National Parks all across the United States free for everyone on April 21. There are just four days in 2018 when national parks across the country will open their doors for free. Many parks are free year-round, but those that charge will give you free rein to explore their beauty. However, only entrance fees are waived. Applicable fees for camping or transportation inside the park are still in effect. After the free-for-all on April 21, many parks will commemorate Earth Day on April 22. 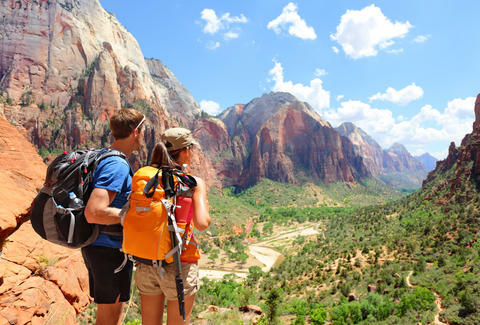 The second day of National Park Week will include a celebration of the National Trails System and the Wild & Scenic Rivers System's 50th anniversary. That's followed by veteran and military appreciation day on April 28 and National Park Rx Day on April 29. The latter of the two features programs designed by the NPS with healthcare and community partners to promote the use of parks and trails as part of individual and community health initiatives. And don't forget to high five a park ranger on your way out, because they're helping keep America's best idea going despite significant obstacles.